* First time depositors only. Min deposit: £10. Max offer: Bingo Tickets worth £30 (on Street Party), Bingo Tickets worth £40 (on Big Bang) plus Jackpot Spins Voucher: (10) Jackpot Spins on Irish Riches JP, available 7-days from valid deposit date. Jackpot Spins win only the Progressive Jackpot, no other prizes will be awarded. Promo code: JACKPOT. Deposit balance is available for withdrawal at any time. Valid until 31.12.2019. General withdrawal restrictions & T&Cs apply. The UK's only site where all winnings are paid as cash with absolutely no wagering requirements! Yes, you read that right...when you win at Blighty Bingo, you win cash and you can withdraw it any time you like! Here's a quick summary of what they offer.. Sometimes you get a HUGE First Deposit Bonus and it has HUGE wagering requirements. This means you have to play through the bonus sometimes as many as 6 times before you can make a withdrawal. Blighty Bingo really get the essence of Blighty, from the red, white and blue Union Jack theme, to the cartoon characters featuring on the site enjoying a good old knees up at a street party. They like to reward their players in a very British fashion with the Ace Club which gives rewards for your continued play. There are 15 levels to progress through and these will see you get increased monthly cashback, FREE spins and even FREE tickets...they will truly treat you like the King or Queen that you are! 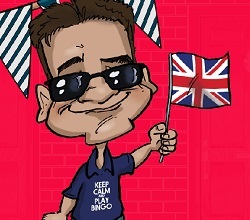 Blighty Bingo uses the Dragonfish software on their new Real Bingo network which aims to allow players to enjoy bingo without the constraits of wagering requirements. Instead of bonuses which you would have to spend on bingo tickets anyway, they straight off hand you a bunch of bingo tickets to certain games to play. We think this is a great idea and takes away that usual uncertainty of...can I withdraw yet? Their only stipulation is that there's a minimum withdrawal amount of £35 and if you have FREE tickets still left to play and make a withdrawal before they do then those tickets will be forfeited. Fair enough we think. You can make up to 10 withdrawals per day too which is handy if the wins just keep coming in! 18+. T&Cs and wagering conditions apply. Check Blighty Bingo for full details.